About a year ago a friend gave me a book called Tuesdays with Morrie, by Mitch Albom. I loved that book, and thought it was so interesting and good, i wouldn't put it down. 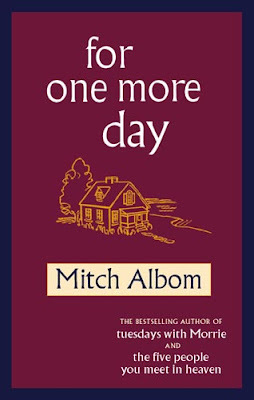 But over time i had forgotten about Mitch and his books, until recently i read another one called For One More Day, and again i could hardly put it down. I would stay up till 3 in the morning reading! I his books are so interesting and have really good life lessons in them, if you haven't checked him out you should consider doing so! Good review. I love getting suggestions from a compulsive reader. I know you know what's good! Thanks for the tip! I've read the other two, but didn't know about this one. Can't wait to read it.